This link takes you to page one of Finnegan’s Wake, a 1939 work by James Joyce that demonstrates both the limits of beginning a story in media res, and a depressing vision of what literature looks like after it suffers a massive stroke. I hope by drawing a comparison between a book that uses the term “bababadalgharaghtakamminarronnkonnbronntonnerronntuonnthunntrovarrhounawnskawntoohoohoordenenthurnuk!” and Soul Reaver 2: Legacy of Kain, I will make it very clear how I felt about this game. “But Jake,” you ask, “Why play through Soul Reaver 2 when only a few weeks ago, you clearly did not like or finish the original?” I have a very complex response to that, involving the tendency of video games to improve upon their originals, but really, Anne gave me the game as a gift, so I had to play it. Kind of like inscribing “Homer” on the disc. She wanted to see it, but didn’t actually want to play it herself. Now I understand why. So as I mentioned, you select “start new game” from the option menu and the game immediately expects you to understand the names of the characters, their back stories and motivations, game mechanics, the history of Nosgoth, macroeconomics, the depths of human psychology, the meaning of life and the true nature of the universe. Also I suspect a few lines of dialogue from the end of the first game would have helped out a little. I suppose, however, the game doesn’t quite deserve the comparison to James Joyce I previously made–the characters use English words with proper sentence structure and grammar, but the content of the text sticks together with all the cohesiveness of a thin film of pond scum. Characters–usually Raziel–tell the story through extensive internal monologues in an accent as authentically British as french fries. The writing carries a very refined sense of self-importance, sounding very lofty, as though an E. coli patient swallowed the King James Bible. These things. They matter. Apparently. Also, watch Raziel float like a plastic action figure! No Deku leaf required! Customarily, I give you a synopsis of the story, but honestly, I have no idea. 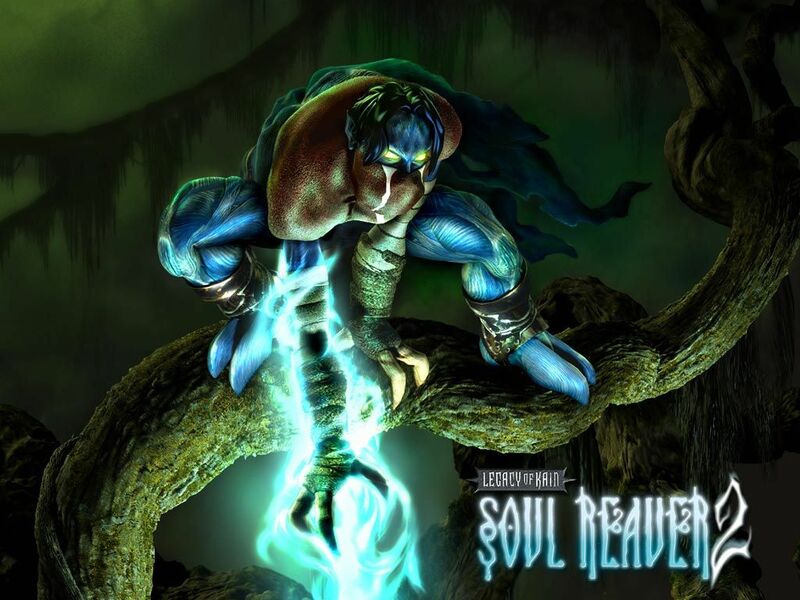 Soul Reaver 2 breathes life into the term “convoluted.” It opens with a verbal spat between Raziel and Kain. Then comes Moebius, who I assume we met in the last game, and whose name in no way indicates the cyclical nature of the plot twist or time travel. Themes of the sword–the Soul Reaver–seemed to spring up time and time again. 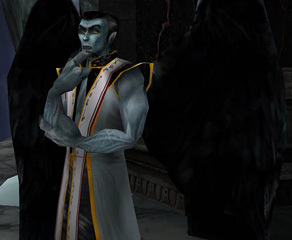 I also picked up that Raziel somehow longs for his pre-vampire human form because of his former goodness and nobility, but–spoilers–he becomes disillusioned with himself after…witnessing his human self kill a vampire? Even evil Raziel mentions early in the game that vampirism “is a plague and had to be wiped out,” but somehow felt morally opposed to the persecution of vampires. Also they talk about some pillars. Apparently somehow these pillars broke and it bummed everyone out. No one ever bothered explaining why. Kain, the ultimate evil upon whom Raziel swore vengeance, skulks around like Smeagol, having pleasant chats with Raziel instead of fighting to the death. Also the Elder God, apparently Cthulu’s estranged cousin or something, appears every so often to have no bearing on the plot whatsoever. 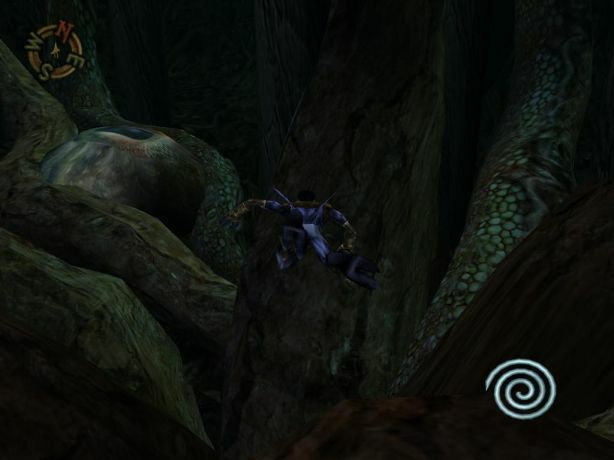 Gameplay involves Raziel running through the Nosgoth, a magical land where every location connects to exactly two other locations adjacent to it. Raziel runs from one end of this course to the other, backtracks, travels through time, then runs through Nosgoth again. Along the way he walks past enemies who would otherwise take too long to kill, recites bland, lengthy monologues, and occasionally pushes some blocks or flips some switches, all the while spending hours and hours lost. In pitch black environments. While people may enjoy video games with “dark atmosphere,” developer Crystal Dynamics may have taken that term a bit too literally. To quote writer Amy Henning’s wikipedia entry: “She also feels that focusing too much on graphics can inhibit a game, saying that once game writers focus on creative expression, video games will greatly improve.” I agree wholeheartedly. But could you at least focus enough on graphics to give us, say, a wall or a floor. Maybe a flashlight, at the very least? People don’t understand how to use darkness and light. In real life, darkness scares people. You don’t know what lurks in the shadows. You have to rely on other, lesser developed senses. However, darkness in a video game usually means tapping buttons unresponsively while staring at a black rectangle and wondering whether you should make ramen for dinner or order a pizza. No did I just find a door, or the floor. Or the ceiling. Or did I visit the night side of Pluto? And get this–the section I described in the post, even darker than this one! 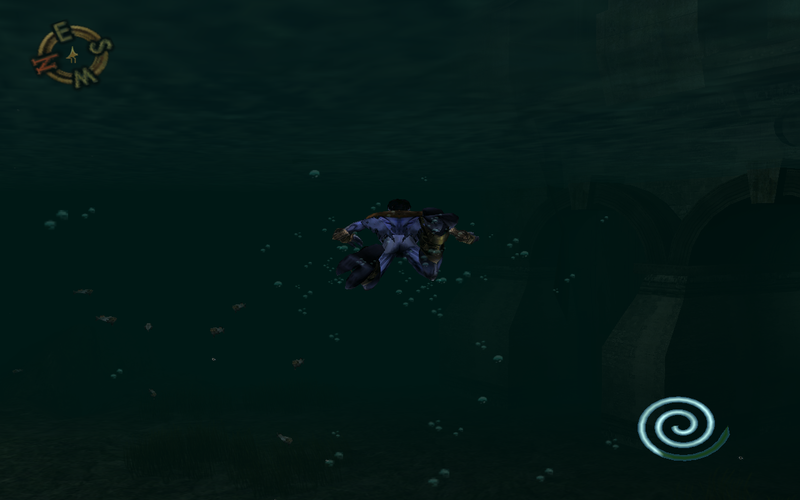 Even better, the game sends you through an underwater labyrinth of caves where the Elder God dwells, utilizing a swimming mechanic that works as well as folding laundry underwater. So in a pitch black environment (with a handful of glowing rocks every so often), you have to navigate through hidden tunnels with a “jump out of the water” button combination that will send you shooting downward (or sideways) if you nudge the control stick even a smidgen of its zeroed axis. And even better yet, the game makes you do this three damn times! I guess they really wanted you to talk to Squidworth. You know, some deep-sea creatures have bioluminescent qualities…. Who lives in a cesspool deep down in the ground? Who turned all the lights off and cannot be found? Crystal Dynamics deserves some credit for fixing a few of the more obnoxious features from the previous game. For instance, you can kill enemies on your own now, instead of hunting around for a boy scouts with some flint to finish them off. Puzzles have also improved, albeit only slightly. If the first game said, “We gave you some generic video game stuff. Do it,” Soul Reaver 2 says, “We finally figured out how other games use these generic video game things. Now do that.” Except do them right, because not only did we not focus on graphics, we also didn’t bother fixing glitches. The game has a number of them, usually the result of failing a puzzle. At one point, I had to float from one side of a cathedral to another without dousing a torch in the pool of blood filling the room. I made it across, but couldn’t figure out what to do with the torch in time. Then the blood rose so high that it covered up everything I needed for the puzzle. I finally figured out that the game had done something wrong–not me–when I swam from one room to the next and fell to the floor, looking back on a room full of blood polite enough to not cross the threshold unless invited. A save point. The game generously gave you two or three of them. Don’t start playing unless you definitely have three hours to kill at a time. A further improvement, the soul reaver sword doesn’t vanish when you get hit–although that doesn’t exactly make combat smoother. If you kill an enemy who has a weapon, the reaver will automatically equip you with that weapon, which all invariably have far less strength than your reaver, and which Raziel can’t use quite as quickly as his opponents can. So combat often involved me dashing for cover, trying to put down weapons so I could use the useful attack again. The reaver does also inhale enemy souls before you can use them to refill your life, but considering the massive amounts of health I lost while whittling my enemies away with a weapon only slightly more powerful than a bronze toothpick, I never saw any reason to not use the reaver. Unlike in Onimusha, where souls come straight to you when you call, like a faithful and well-trained Labrador, when Raziel calls souls, they act like cats, fat and sluggish, interested in the treat you have, but kind of lazy after the big meal they just ate. Unfortunately, small tweaks that bring the game up from “beginner’s effort” to “uninspired” don’t really make the game worth playing. I found it tedious and frustrating–like when I encountered enemies shorter than Raziel’s waist. He swings his sword in waist-high horizontal strokes. Only. So I’d always have to lure these monsters to a hill or incline because my character, named for the Hebrew Angel of All Knowledge, couldn’t figure out the first trick that Link learns in every game. Then by the end, approaching the nearest thing the game has to a boss fight, they hand me an upgraded soul reaver that makes Raziel invincible. Totally invulnerable to anything. For the rest of the game. Yeah, I suppose the plot twist after the final boss did entertain me for about ten seconds, but seriously…why even have a battle if you can’t die. I spent a lot of time looking for this guy. Raziel felt very close to him during the three minutes of screentime he has. This is him wonder why. With writing full of cliches like “this opened my eyes!,” stupid puns like “feel the pull of history” as some mystical force drags me across the room, and human enemies lobbing taunts learned in a night-school course on one-liners for minor characters in fantasy games, I easily grew bored. The relentless monologues put me to sleep and the hoity-toity language just sounded like a sophomoric attempt to sound cultured. 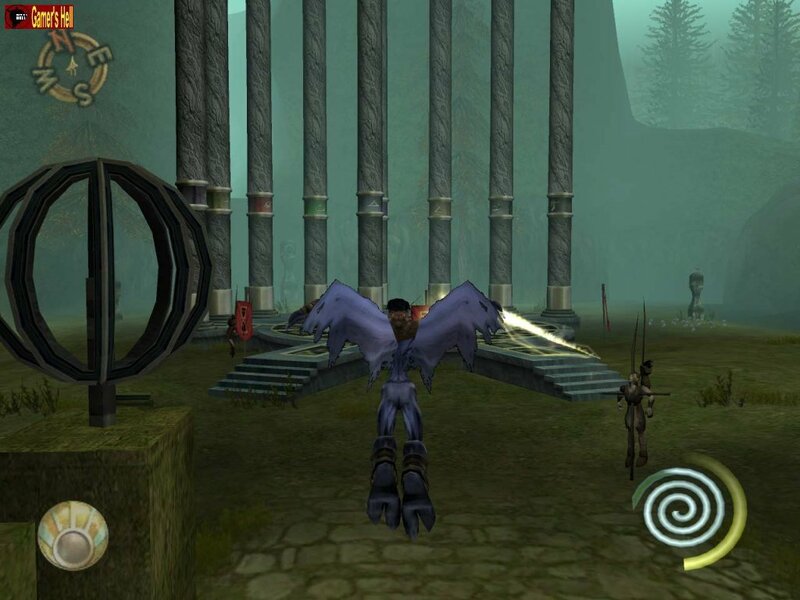 At one point Raziel shouts out the phrase, “Spare me your elaborate metaphors!” Please do, Soul Reaver 2. Please do. 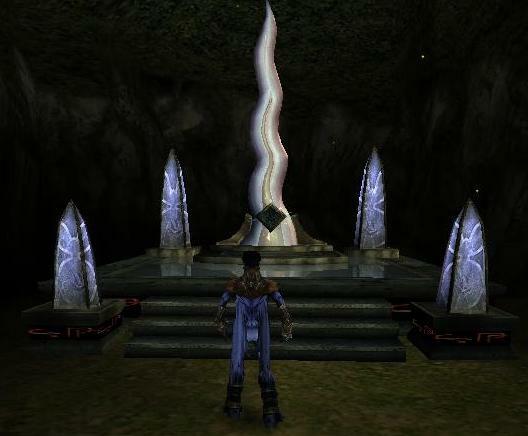 This entry was posted in Android, Legacy of Kain, Mac, other non-consoles, PC, PS2 and tagged Legacy of Kain, PC, ps2. Bookmark the permalink.